Guest Post: Pack it up. Pack it in. My name is Angie, I own a company called FETCH: Lifestyle Management. FETCH is devoted to personal organization as well as small business development. Enough about me, let’s get started. I’m so excited to be a guest blogger for HSS Feed so thanks for having me! 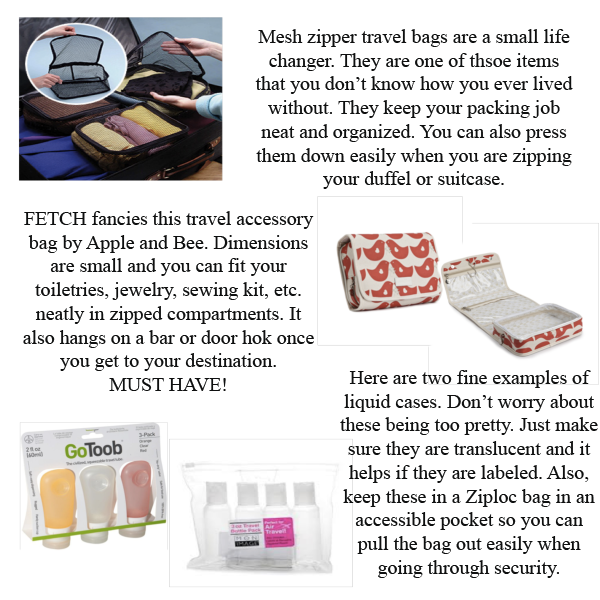 Today’s post is dedicated to travel tips to help you properly pack it up and pack it in. In addition, we have included some fantastic travel merchandise suggestions. We know the drill… one suitcase or duffel and one carry-on. None of us want to check bags. So if you don’t have to, don’t do it! Think before you pack. DON’T use your purse or laptop bag as your additional carry-on. 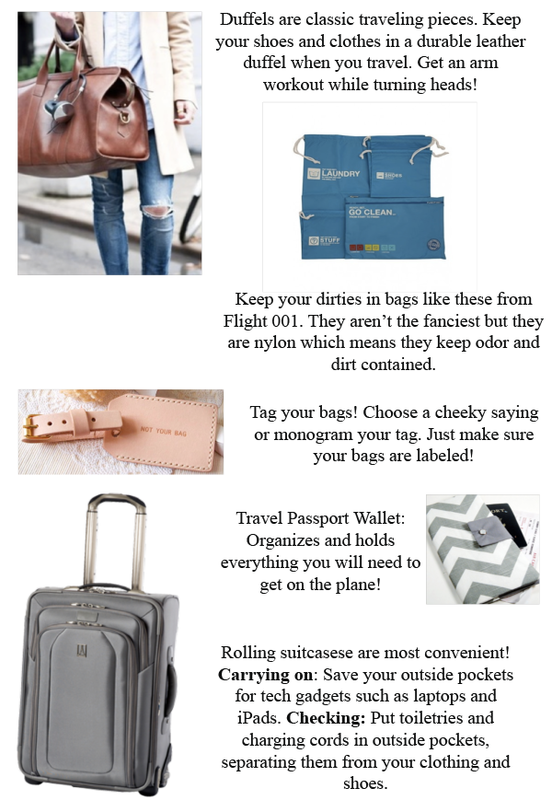 Pick a bag that can stow your purse and laptop along with your toiletries and other small items. DO pack interchangeable pieces. If you are going to be traveling for more than four days, take advantage of hotel laundry services OR carry your own travel size detergent and wash the small stuff in your sink. DON’T bring your entire closet. Stick to your first choices and leave the rest at home. Limit the clothing you pack and wear what you can onboard. DO bring THREE pairs of shoes. Pack two of them, and wear one. Lay out your vaca wardrobe before you pack it in (duh, right?!). Separate your jeans and other heavier items from your lighter and smaller clothing items. If you are packing a coat, a puffer coat can be included with your heavier items. If your coat resembles a trench, plan to wear it onboard. Roll your jeans, t-shirts , and belts. Put larger items in your suitcase first. Pack the heavy items first (i.e. shoes, blazers, heavy pants, etc.). 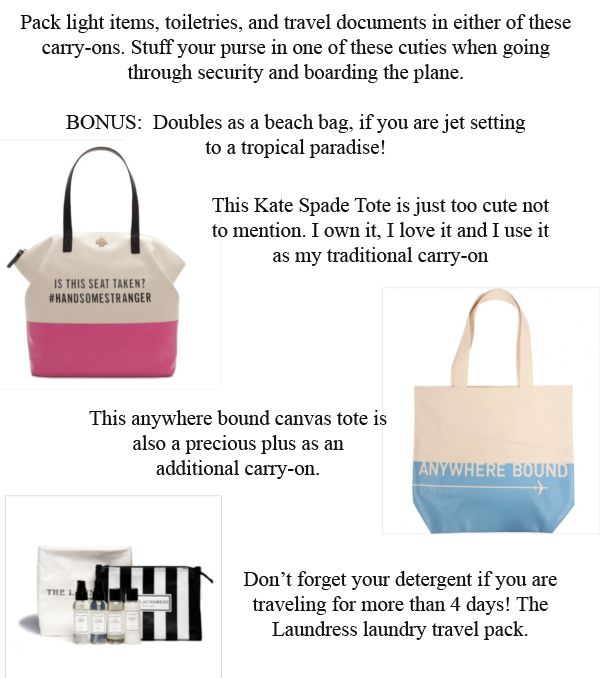 These items will be at the bottom of your suitcase or duffel. Pack the light and small stuff last (i.e. t-shirts). These items will be at the top of your suitcase or duffel or be squeezed into the tiny crevices between the bigger heavier items. Use electronic boarding passes whenever possible. Check in as close to 24-hours as you possibly can. Need help choosing? Try www.seatguru.com. When choosing your coach seats, the seating between the wings are the safest place on a plane. If you are not flying in business class, be courteous and accommodating to flight and gate attendants and remember, well-dressed single passengers have a better chance of getting bumped to an available business class seat. If you are an international traveler, bring an eye mask and ear plugs for sleeping. FETCH has pinned many more wonderful travel merchandise options on our WONDERLUST board. Big thanks to Angie for contributing and helping me enjoy my vacation! I’ve just recently found out about her company, FETCH, and I love the concept. Check them out on Facebook and Pinterest as well. Here’s to many more collaborations!